Pack your imagination bags, we’re going to Spain. I’ve fallen in love with my local history. The places near my home have become historically sentimental to me. I spent all winter studying old local maps dating from 1899 to as far back as 1842. A true history nut, I fell in love with the 1793 tavern down at the corner. I recently got permission to detect there. What could still be there after over 200+ years of changes? What would I discover? I love the chicken corn soup served in the modern restaurant there now, but what historical evidence could I find of the old tavern? My favorite hang out. The 1852 tavern map illustration. My research indicates it was built in 1793. Much has changed. 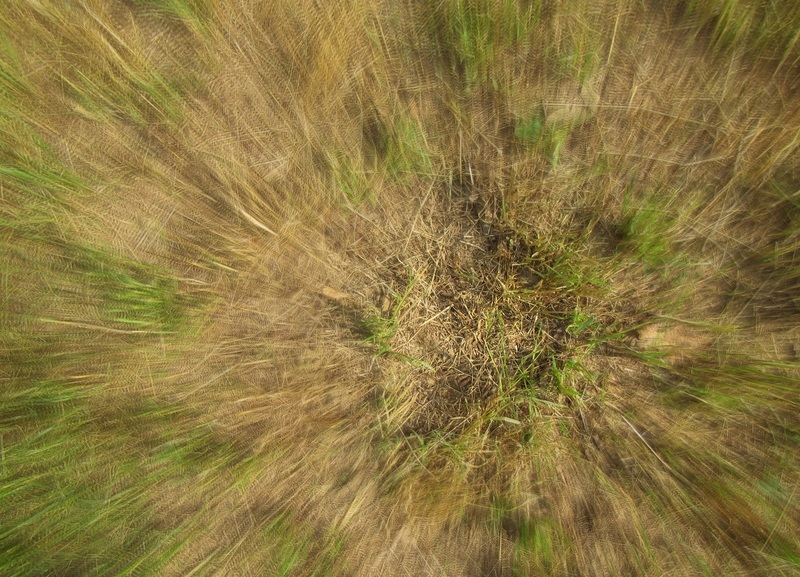 But in one spot in the ground, nothing changed at all. Permission granted and the knee high hayfield cut, I drove the half mile down to the corner. Behind the old tavern, I was swinging my metal detector like a magical dowsing rod thirsty for history. I was hoping for a random drop of artifact or coin that would provide a direct connection to the tavern. What I found was quite magical and took my imagination a lot further than a mere half mile from my house. ‘Something shiny’ just awakened from a very long dirt nap. It’s really an undescribable moment discovering something I’ve never seen before. I had no idea what this was. Just the rush and thrill of anticipating the story it would tell. It was just bigger than a quarter. After any nice find I tend to take a break and enjoy a smoke. This time I sat under a shade tree for a while and had two. I held it in my hand and dreamed of what it could be. I love the feel of soil on my hands. It’s unexplainable, but to me, they feel clean with earth. I knew it was a great find. 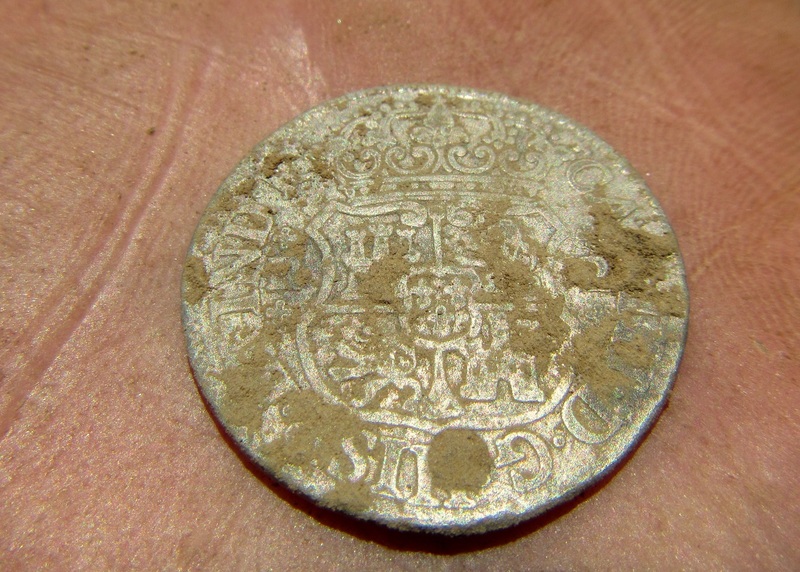 But it wasn’t until I got home I discovered that merely four inches under the hay I had recovered a silver 1768 King Charles III Spanish two reale. A ‘Piece of Eight.’ Pack your imagination bags, we’re going to Spain. The 1768 dated side. The inscription in latin: VTRA QUE VNUM means ‘Both Are One.’ This relates to the two spheres over the ocean; the old and new worlds. 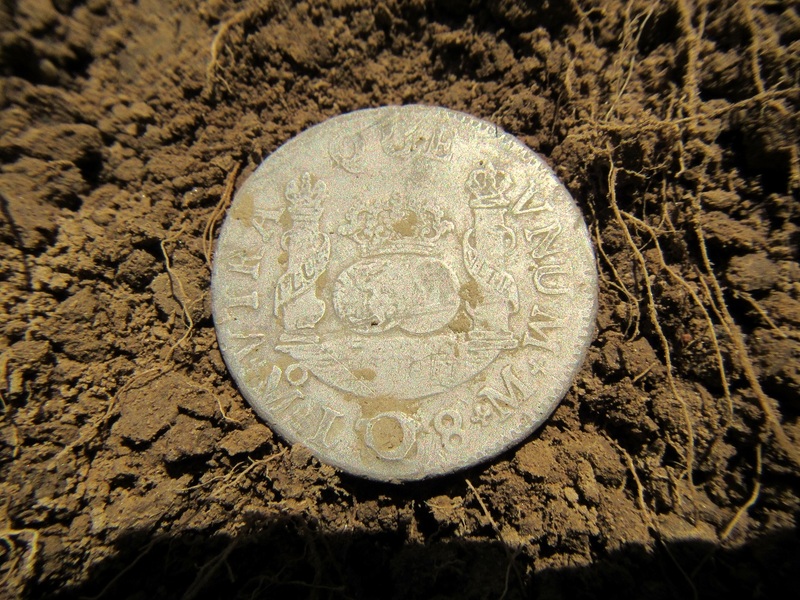 The M with a small o indicates this was minted in Spanish occupied Mexico City. 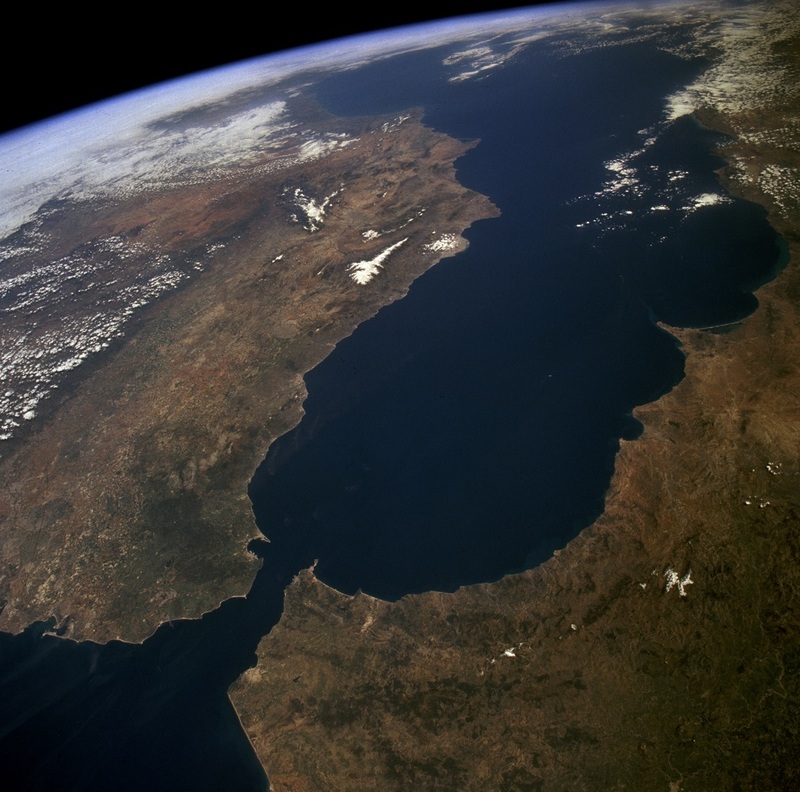 The Spanish Royal Crown hovers over both worlds and the pillars to each side are the Pillars of Hercules with a banner around each, on the left PLUS and on the right VLTR meaning ‘More Beyond.’ The Pillars of Hercules represent the rocks of Gibraltar. 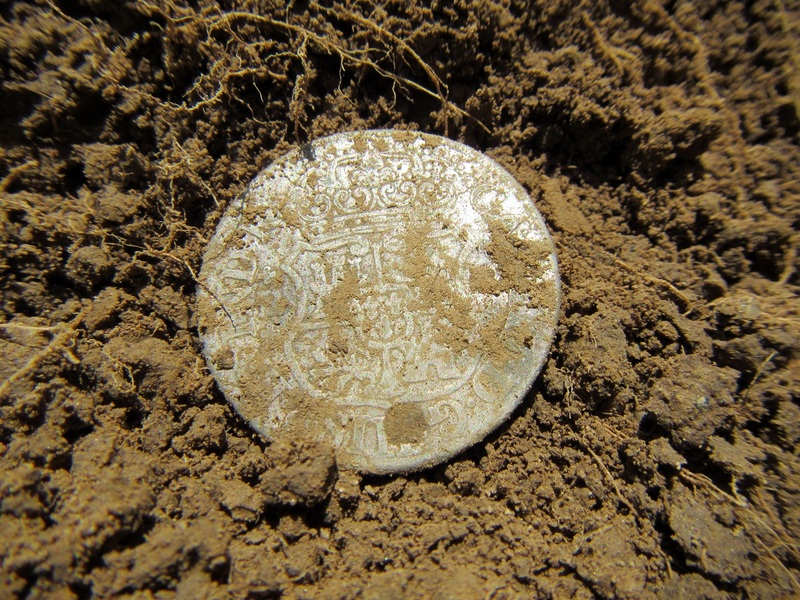 This coin was a cob, meaning it was cut from a silver bar and screw pressed. 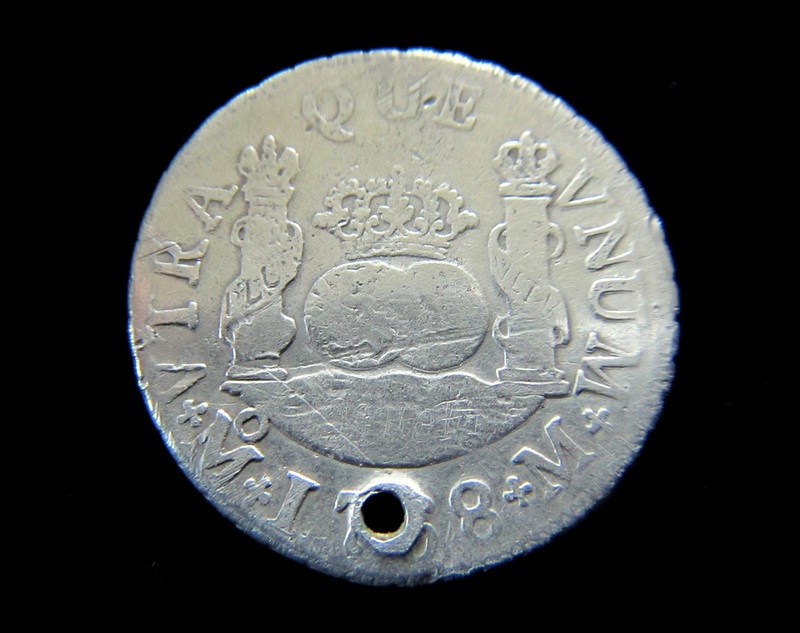 Despite being ‘holed’ (discussed below) the 1768 date is apparent as this style two reale was only made during the years of 1760-1771. There is controversy over which side is the obverse and reverse, as this has the date on one side yet the king on the other. 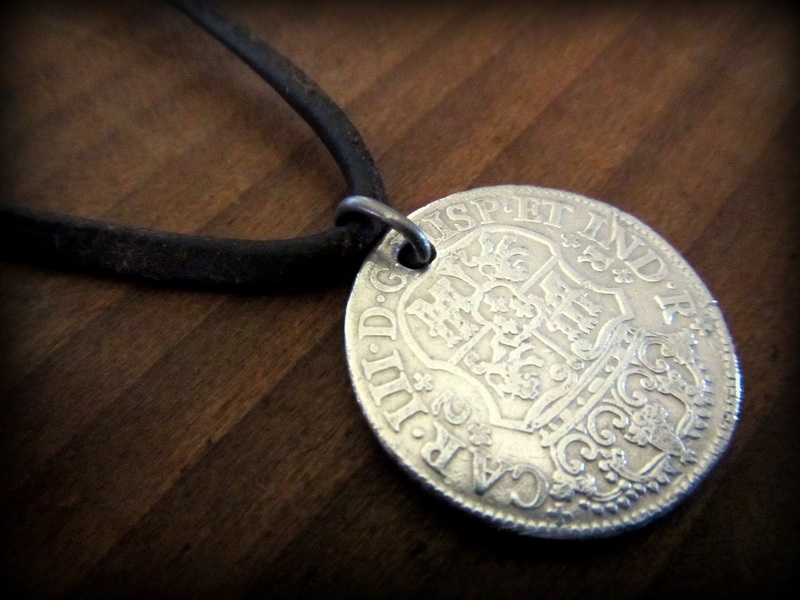 This side identifies the value as seen by the R and the 2 on either side of the coat of arms. The latin inscription translates: CAR III KING OF SPAIN AND INDIES. On larger bust versions of later years, you see KING CAROLUS III. Known as Carlos in Spanish, or Charles in English, either is correct. The coat of arms depicts in the very center with the three fleur de lis’ the House of Bourbon, which was Charles’ father’s side and Charles had quite the ‘bourbon nose.’ The castles represent the Kingdom of Castile, and the rampant lion represents the Kingdom of Leon. At the top, the Spanish Royal Crown is extremely detailed and beautiful. King Charles III ruled Spain and the Spanish Indies from 1759 to 1788. It would be exhausting to attempt to include his history here and that is easily accessed on Wikipedia or elsewhere. A very intriguing mystery. 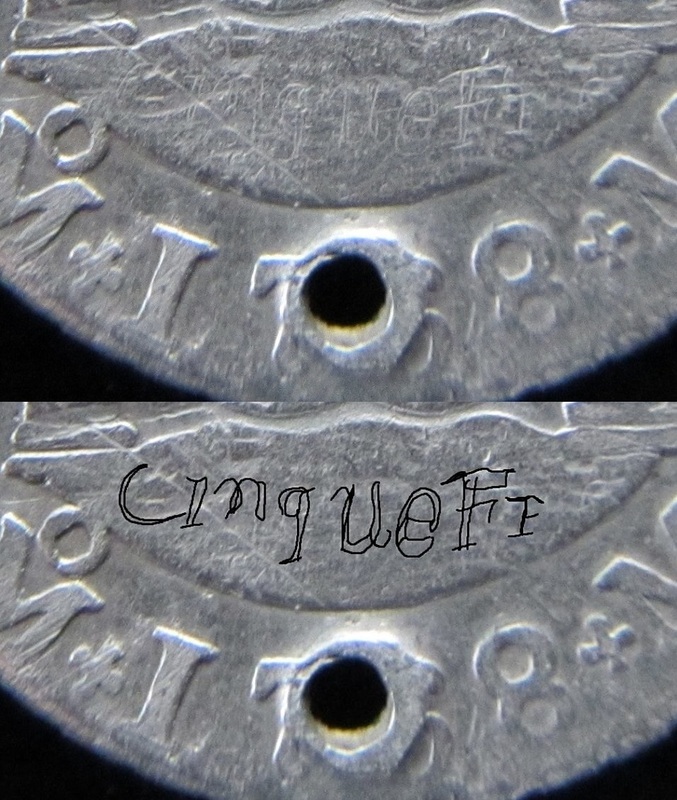 The word Cinque and Fi or Fr (incomplete r?) was clearly hand etched into the ocean area. A close up natural and below it I’ve traced the etching in black. The lettering is definitely period, as seen in the double lined letter post style. I am still researching this. Thus far I have come across this: ‘From Vulgar Latin, cinque, dissimilation of Classical Latin quinque “five”, in Late Latin also cinque. In the days of worldwide currency, did someone etch with a sewing needle or nail the possible value equivalent for five francs? Not sure, and may never know. The entire letters/word is only 3/8 of an inch across and the F is 3/16″ high. Hard to see with the naked eye. A very long time ago, someone was not only literate, but had a very sharp eye to match their etching tool. 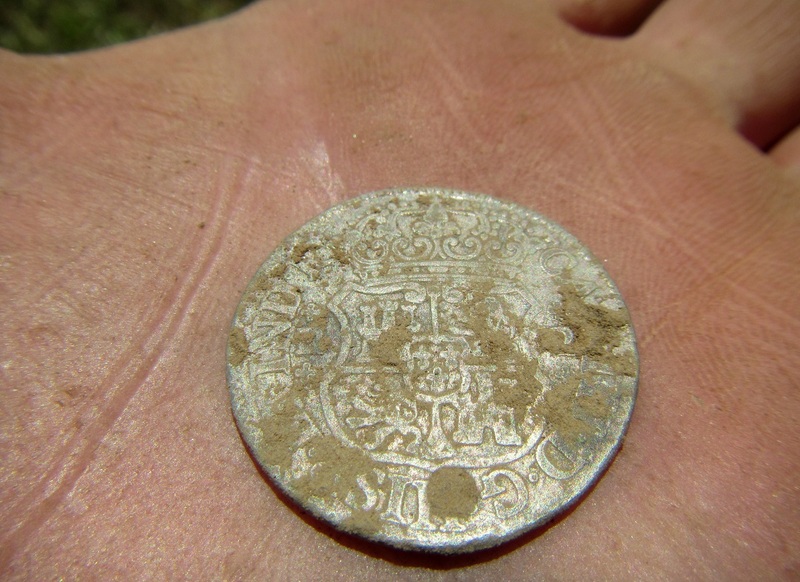 This is one fascinating 247 year old Spanish silver coin. The American dollar is based on the Spanish dollar. This 2 reale is a quarter, or known as ‘two bits,’ as in the old jingle: “Shave and a haircut, two bits.” A single reale was a bit. Four 2 reales made an eight reale, a dollar. There are some who posit that the dollar sign originates from the banner wrapped around the pillar of Hercules, but I am a firm believer that it came from the letters US imposed and the bottom of the U bend was lost over time. 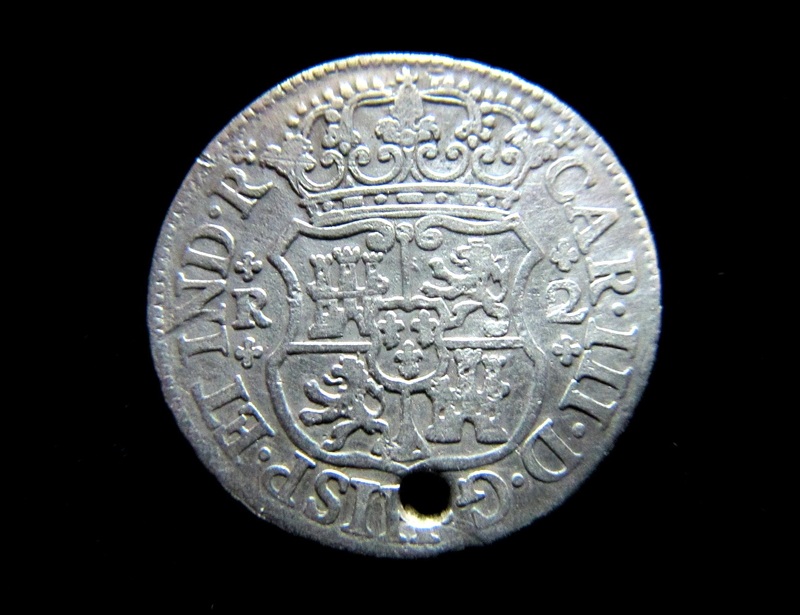 Holed coins were not uncommon during colonial times. There are a handful of valid reasons why this was done. First, not all clothes had pockets, and coins could be strung when hole punched. Also, they were often sewn inside the lining of coats and clothes. Indians strung them as well, for wampum and as ‘tinkers’ which may have been a necklace of sorts which made a pleasant jingling sound. It is also known that emancipated slaves sometimes wore a coin as a symbol of their freedom. Purist collectors want ‘undamaged’ examples without the hole. 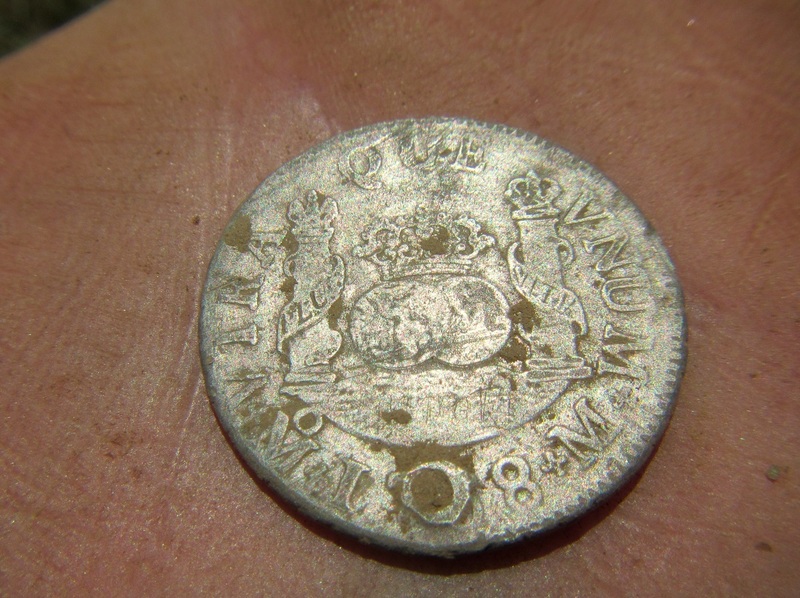 I’m not a coin, but a history collector, so the hole only adds to the story of this beautiful piece of history. It’s not a retirement piece, nor is it rare. I researched and without the hole, current market value for one like this is around fifty dollars. In very fine condition one may fetch a hundred dollars. The added interest of the hand etched word may make this more desirable on the market, however I wouldn’t consider parting with this. I don’t do this for the money, but for the love of history and thrill of discovery. Of all the things in my life, I value money the least. Why can’t I be more conventional? Everytime I hold it in my hand, my mind boggles. Who etched something in it and why? Where has this coin traveled? Who dropped it? What year was it dropped? I find it interesting that in early America, world wide currency was common and legal tender until the Coinage Act of 1857. I can only wonder at the tavern barkeep’s keen sense of currency. Could I buy everyone a round with this 2 reale? What change would I get? Would it be a mix of American large cents and a King George II half pence? And if he short changed me, how would I know? If I had a time machine, I’d probably never come back. But I do have a time machine. Have detector, will time travel. ‘Why Try to Change Me Now’ by Cy Coleman & Joseph A. McCarthy. Frank Sinatra did this song very early on, but for me, Bob Dylan does it best on “Shadows in the Night” (2015). Dylan just turned 74 on May 24th; I found this coin on his birthday.